Tax season is about to start and we want to update you on relevant tax changes. 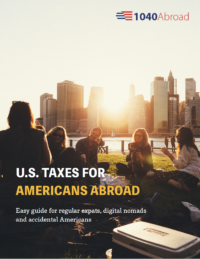 Mark down what is going to change on your US expat tax return. We told goodbye to 2017 tax year and welcome 2018 as the dawn of a New Year. Let’s look at the IRS updates that will be applied to your 2017 US expat tax returns. Including tax brackets, Obamacare, Foreign Earned Income Exclusion and Personal exemption for 2017’s tax return. Contact us if you want to get your 2017 tax return sorted out and use available deductions to save money! Foreign Earned Income Exclusion: what’s new? Now for the figure that many Americans living abroad were looking forward to the Foreign Earned Income Exclusion (FEIE) for the year 2017! In 2017, eligible taxpayers can exclude up to US$102,100. As many of you do, you might be able to reduce your tax liability to zero using this exclusion! What has changed in Obamacare (The Affordable Care Act)? The Affordable Care Act (ACA – otherwise known as Obamacare) provides penalties for most US citizens who are not eligible for health insurance and are not exempt from such coverage. If you qualify for FEIE using either the physical presence test or the bona fide residence test, you are exempt from ACA. You would of course also be compliant if you have an health insurance compliant with ACA. A few expat insurances are compliant, but by qualifying for FEIE, you can freely get a foreign-based insurance. Hence, you do not have to be concerned about any penalty. Unfortunately, if you do not qualify for an exemption or have qualifying coverage, you may have to pay this tax. You can calculate this penalty in two ways: the percentage of income method or the person-by-person method. Please note that the IRS charges the greater of two penalties. The interest rate method for 2017 is 2.5% of the adjusted gross income of your household. The maximum penalty according to the interest income method is the national average of the total annual premium for the bronze plan (the lowest level of the Obamacare coverage). The per capita method is calculated at $ 695 per adult and $ 347.50 per child and the family at a maximum of $ 2,085. UPDATE: This was the case in 2017 and penalties don’t exist anymore in 2018. For singles and those who are filing as married-filing-separately, you can enjoy a standard deduction of $ 6,350 (compared to $ 6,300 in 2016). If you are filing as married-filing-jointly, you now have the doubled amount of $ 12,700 (compared to $ 12,600 in 2016). For those who are the head of the family, your standard deduction for 2017 is $ 9,350 (compared to $ 9,300 in 2016). Meanwhile, IRS already announced the updates for 2018 tax returns, meaning they will start working in 2019. Check them out here. Get in touch with us if you have any questions regards your US expat tax situation and we will get back to you within 24 hours.